In November 1943, Marine 1st Lt. Alexander Bonnyman, Jr. was mortally wounded while leading a successful assault on a critical Japanese fortification on the Pacific atoll of Tarawa. Bonnyman’s remains, along with those of hundreds of other Marines, were hastily buried and lost to history following the battle. In 2010 Bonnyman’s grandson, Clay Bonnyman Evans, was privileged to join the efforts of History Flight, Inc., a non-governmental organization dedicated to finding and repatriating the remains of lost U.S. service personnel. 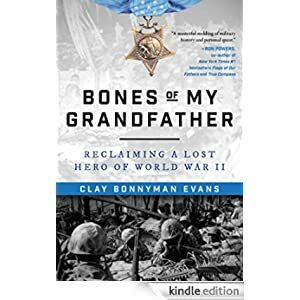 In Bones of My Grandfather, Evans tells the remarkable story of History Flight’s mission to recover hundreds of Marines long lost to history in the sands of Tarawa. On May 29, 2015, Evans knelt beside a History Flight archaeologist as she uncovered the long-lost, well-preserved remains of of his grandfather. And more than seventy years after giving his life for his country, a World War II hero finally came home. Buy this book today for just $1.99.